Over 30 Thanksgiving snacks for preschoolers through second grade. dip cookie and marshmallow in melted chocolate “glue” together to make a hat place jelly bean as hat buckle ENJOY! My preschool does a Feast called “Our way of saying Thank You” We know the children all don’t like turkey so we have a Thanksgiving Day Pizza Feast and we invite the parents to lunch. The kids love this and so do the parents. I teach 3 yr. olds and instead of having all the traditional foods associated with Thanksgiving, we had a Feast of Favorites. A few weeks before our feast I asked each child what his/her favorite food was and how they make it. I copied these down verbatim. Then I asked the parents to send in a dish of their child’s favorite food while I made up a menu of our feast including ‘cooking’ instructions. We had a blast! We ate chocolate donuts, shredded wheat, several dishes of macaroni and cheese and even some pumpkin pie. It was a hit and the menu became a memento to send home. “Glue” a marshmallow to the top of a fudge striped cookie using icing. Let icing harden. Dip the marshmallow and cookie in melted chocolate. Use gel icing to make a buckle. Now you have a hat! Have the children make their own cornucopia for snack by filling a sugar ice cream cone with fruit snacks, Trix cereal (each piece is in the shape of a fruit) and/or real fruit such as berries and grapes. Our students really enjoyed making and eating this snack. For Thanksgiving, we let the kids experiment with making “stuffing.” We filled several bowls with plain croutons slightly crushed, and let the kids sprinkle in different seasonings such as garlic or onion powder, celery seed and dried parsley. Then the kids used a squirt bottle filled with water (the picnic-style ketchup and mustard squeeze bottle worked best or a turkey baster and bowl of water). Then they stirred, added more spices or water and some of them even tasted the stuffing. The kids absolutely loved this activity since they were able to “cook,” and it’s a great activity for sensory experiences and fine and gross motor skills. We did this with my son’s class. Each mom brought the ingredients of having a turkey dinner. One mom that is a teacher at our high school used their oven and cooked a turkey. We had mashed potatoes (but no butter/gravy). We made up no-bake pies. Rolls, pickles and some of the basic items. The kids made up anything that had to be made up. I believe there was a Jell-O salad made with whip cream and power dry Jell-0. The table was set with tablecloths and little tiny pumpkin candles and they turned out the lights and the kids said a prayer (in a public school) yes! Then the kids ate in the dim daylight of the room. Something they will always remember. Use bowl w/lid or glass w/lid. Add instant van. pudding and milk. Have children take turns shaking until pudding is make. Then add one or two tsp. of pumpkin pie filling, a dash of cinnamon. Shake and serve. This taste great. All my children really enjoyed this treat!! I did this last year and the kids loved it. Use a Nutter Butter cookie for the body, cut our fruit roll-ups for feathers and the waddle (or use gumdrops), pretzel sticks for legs and raisins for the eyes. Be sure and take a picture of your little chefs for the parents to see. Edible Turkey’s-Each year we make edible turkey’s for each child to eat or take home. Each turkey will need 1 Oreo cookie, one chocolate covered cherry, five candy corns, one butterscotch baking chip, one red hot candy and chocolate icing. Take 1 Oreo cookie, separate it and remove the white filling. You may need to help the children or already have this done before starting. The Oreo break very easily when trying to separate. One Oreo cookie half is the base which you place a chocolate covered cherry on with the icing. Then take the other half of the Oreo cookie and attached it to the back of the cherry with the icing so the candy corn can be attached (points down for the feathers). You will need 5 pieces of candy corn. Next, take a butterscotch chip and attached with frosting for the head and a red-hot candy and attached to the butterscotch chip for the gobbler. 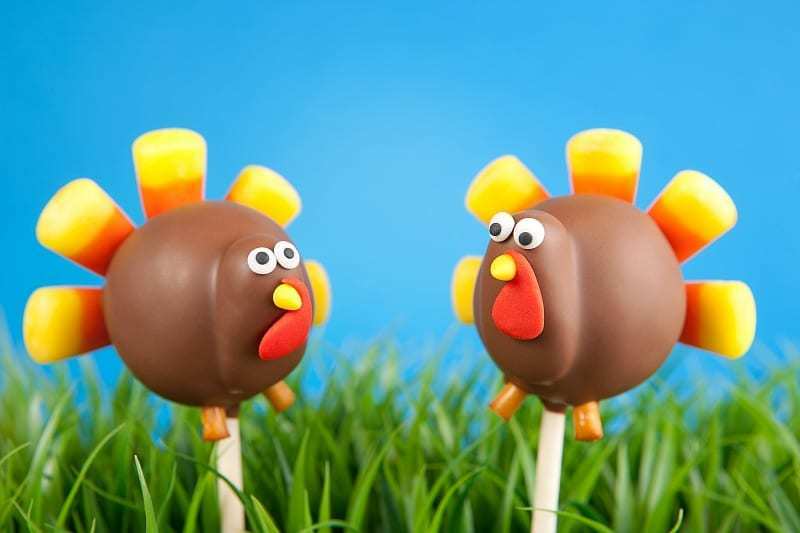 You now have an edible turkey. I can’t tell you how many compliments I get from the parents each year when these are made! The kids love them too!